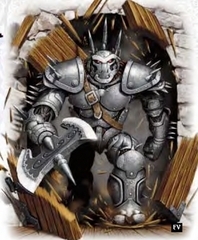 Racial specialization: Adamantine Body: At the cost of mobility, a warforged character’s body can be crafted with a layer of adamantine that provides formidable protective armor and some damage reduction. Your Ac bonus from composite plating increases to a +6. You do not get your dex bonus to ac. Your speed is reduced by 10 feet. You can not wear armor. You are considered to be wearing heavy metal armor and proficient in its use but can not gain feats that list heavy armor proficiency as a requirement. You have disadvantage on stealth checks. Your body can be enchanted like armor, but you must be there for the entire duration of the crafting process.. Some believe that the ultimate expression of the warforged experiment is the juggernaut, a path that allows warforged to become more and more like true constructs and less like their living creators. As a machine of war, the juggernaut is among the best at dealing damage and sustaining punishment. Some warforged refuse to take up the mantle of juggernaut because it accentuates their construct heritage at the cost of their living aspects. Armor Spikes: A Warforged Juggernaut grows armor spikes and gains proficiency in their use as a weapon. If you have grappled a target or the target has grappled you, as a bonus action, make a melee attack on the target, the adamantine armor spikes deal 1d6 points of piercing damage. While the spikes can’t be removed, they can be affected by spells like any other weapon. At level 10, the spikes damage increases to 1d8. The spikes are treated as adamantine in regards to resistance and immunities. Reserved: A Warforged Juggernaut begins to distance itself from living creatures. Because of this change in its nature, a warforged juggernaut takes disadvantage on Deception, Persuasion, and Insight ability checks. Construct Perfection: A warforged that follows the path of the juggernaut seeks to improve itself by embracing its construct heritage. As a warforged juggernaut advances, it abandons what it considers the weaknesses of the living construct form to gain qualities more indicative of true constructs. While retaining its intelligence and sentience, a warforged juggernaut gains the following construct features as it advances in level. Level 18: No longer subject to ability damage or ability drain. Immune to Necromancy Spells. Powerful Charge: At level 3; gain the Charger feat for free. If you use the shove caused by the charge, on a success you deal the Armor Spikes damage to the target. You get an additional +1 bonus on the attack roll when using the melee attack choice. At level 10: You are treated as one size category larger when shoving. Gain an additional +1 (total +3) on melee attack roll of the charge. At level 15: If you use the Charger feat and choose to attack and the attack hits, the damage bonus increases by +5. Gain an additional +1 (total +4) on the melee attack roll of the charge. Wrecker: A warforged Juggurant has advantage on strength checks to breaking down doors. Healing Immunity: Starting at 3rd level, as a warforged juggernaut becomes more like a construct and less like a living creature, it is treated as a construct when a healing spell is used on it. In addition, it can no longer benefit from the effects of consumable spells and magic items, such as heroes’ feast and potions. If Mending is casted on it, mending heals the juggernaut 1 point if used at cantrip level or the caster can spend addition spell slots turning the heal into 1d8 + caster ability modifier and an additional 1d8 per spell slot level used. Would this be a replacement to your class, or an addition? If it was used or allowed. I would be changing my barbarian levels to fighter as it would fit Overdrive more thematically, as hes more a construct then a free willed warforged. Of course I wouldn't be using it toward its game breaking potential as I tend to keep to my character concepts. I just do these for amusement and felt like posting here first before I do on the dnd forums. And see, this is one of the few issues I have with 5e. Although I think its great that they toned down the reading quite a bit, I feel that, with advanced players, options like this should become available. For example, I once saw a literal "Dashing Rogue" archetype that replaced the Rogue archetype, but also involved stuff from the bard tree. It would be cool if a few play tested homebrew rules were put in place. I have a few homebrew classes I might post to the forums tonight while procrastinating on studying for my test tomorrow. Well class specializations are basicly the knockdown version of prestige classes and archetypes. There isn't a formula to convert a balanced version cept for playtesting and discussion. The damage resistance in this test was simply putting the damage reduction from the adamantine body feat (which was one of the requirements in 3.5) into something useable. Though I could change it to something less potentially broken since old damage reduction did nothing to energy damage types. Then I would have to add in some of the other bits early on.